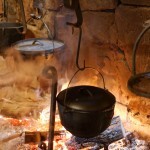 Cooking with Cast Iron … Learn about hearth cooking as well as purchasing and caring for new and vintage cast ironware as well as restoration of creepy old rusty iron pots and pans. Particulars and dates to follow. 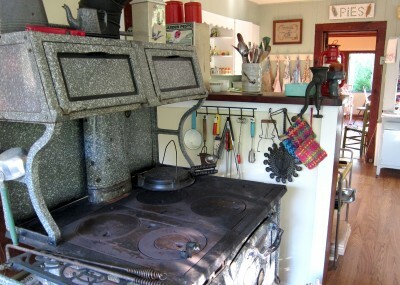 Antique Wood Cookstove Cookin‘ … Includes a wood-chopping lesson followed by instructions on how to find, restore and cook with your own cookstove. 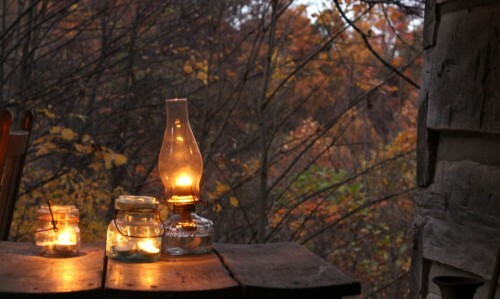 Or just come and enjoy a bit of Appalachian nostalgia. Info. and dates to follow. If we don’t have any classes currently scheduled, please get in touch if you’d like to arrange a private cooking class for your group. Classes are held 5 miles east of downtown Asheville in our 1930s log cabin in the retro-kitchen equipped with with vintage kitchen gizmos, dishware, and lots of cast iron. Appropriate attire is a must … choose from our large assortment of 1940’s-60’s colorful printed feedsack aprons. Cooking classes are hands-on, limited to 8 participants, and include printed recipes and sometimes a copy of one of my books. 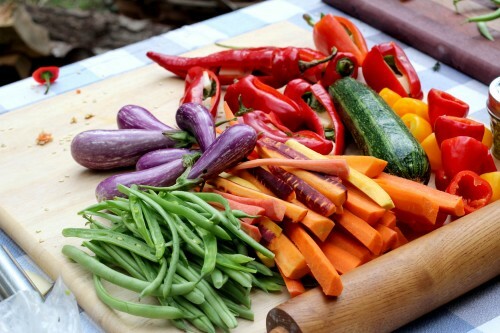 Ingredients are always local, organic when possible and often picked from our gardens. I prepare healthy versions of traditional foods that will leave you satisfied and perky. Special dietary restrictions are accommodated when possible. Unless otherwise noted, all foods prepared are gluten free (but kitchen is not a dedicated gluten free space). Most classes are $50 a person, including ingredients. Contact Barbara. Prepayment by credit card or check is required to hold your spot. Cancellation policy: Because I source ingredients locally and often have to search them out, no refunds are given. (But you can send someone in your place.) If I need to cancel a class due to insufficient registration, I’ll let you know 3 days before the class and you will receive a full refund. Private classes available: Contact me if you’d like to schedule a cooking class for your group. Minimum of 6 people, maximum of 10, $50 per person. I’m pretty sure that no other cooking school has offered this not-to-be-missed class before. 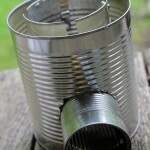 We will gather together with tin cans and tools and craft an amazing little portable upcycled lightweight camp stove. You can read about it here. Wayne and I will talk a little about the history of early American hobo men and women while we work, and then we’ll gather veggies from the garden and cook our supper on our little stoves. 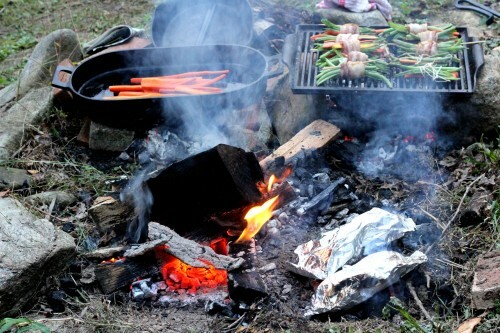 Each of us will cook a different dish which we will then share picnic-style along with cheap wine cloaked in paper bags. Just kidding. We’ll make some 1920s speak-easy style vintage cocktails after we finish using sharp tools. 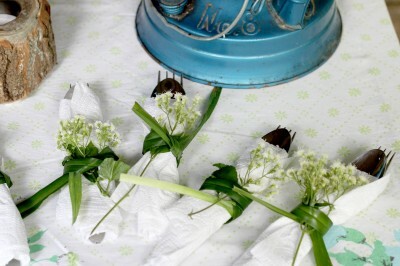 For this class, you’ll need to bring your own tin cans and tin snips, if you have them. I’ll send you particulars when you register for the class. 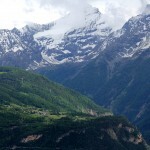 All the way from the magic storybook-land of Aosta in the Italian Alps, come Annie Erbsen and Gianluca De Bacco to teach you about preparing polenta … the “heart” of rustic northern Italian peasant fare. You can read more about their amazing story here on my blog and here on Annie’s blog. pignoletto rosso polenta. (ps the raspberries are ripe in our garden). Guess who’s bringing the pies to your Thanksgiving gathering this year? YOU ARE!!!!! Go ahead and claim pumpkin and/or pecan pie as your contribution to the feast and we’ll make you a pie lady/feller just in time. First, you’ll create a flaky butter crust that will change your life. Then you’ll fill it with either heirloom Appalachian Candy Roaster pumpkin, toasty oatmeal coconut (mock pecan) or a malty crunchy pecan filling. 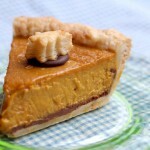 Each participant will leave with a baked 6-inch pie and a copy of Barbara’s Lost Art of Pie-Making Cookbook. We’ll start the class with a glass of wine and a savory snack, but, make no mistake …. it’s pie for supper! Fun rustic, affordable, seasonal dishes and stress-free tips for prep, serving, and beautifying your table. No big expensive roasts or fancy drips for our spring gathering … we’ll start off the evening with a variety of garden fresh appetizers that can be prepped in advance and rhubarb/mint mojitos. We’ll set our table with vintage tablecloths, flowers and greens from the yard and hang some home-made canning jar lanterns from the trees. Guests will help you to make the herbed, flaky-layered flatbreads that they’ll fill with veggie and/or local fennel sausage kebabs. Spring salad in cups (peas, radishes, etc. ), and a drop-dead gorgeous painless potato gallette follow and the dinner ends with super thin slice and bake almond cookies poked into your boozy spring sorbet (no ice cream maker needed). 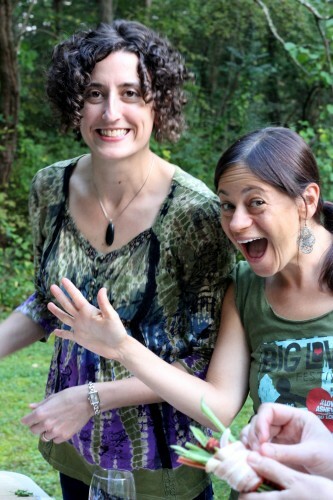 Join Annie Erbsen De Bacco for an evening of fun and feasting as she teaches you to make homemade artisan cheeses using local low-temperature pasteurized cow’s milk. You’ll make fresh mozzarella, ricotta, & fromage blanc in class, and then we’ll enjoy them with fresh veggies, fruits and herbs from our gardens. 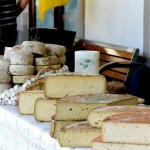 Wine, cheese and homemade jam pairings …. YES! Cross two adventures off your bucket list in one afternoon! Learn the secrets to crafting a super flaky butter crusted pie and discover how easy it is to play a tune on the banjo. No experience at all needed for either! We’ll gather in the log cabin kitchen for a pie-making lesson, and while the strawberry/rhubarb (or apple) pies are baking, you’ll learn to pick a traditional mountain tune on the banjo with my husband, Wayne Erbsen. Banjo rental included. You’ll leave with a pie for two and enough crust to make a 9-inch pie at home. Pre-payment required to hold your spot. Class size is limited to 12. Vibrant spring salads from the freshest ingredients with creative accompaniments and dressings. This class will be about pairing flavors and textures to create stunning (mostly) raw salads from spring greens, veggies and fruits. We’ll start off the evening by picking a variety of greens from our gardens and then we’ll make salads and dressings in all their glorius forms. We’ll practice plating, presentation, wine-pairings, and then several simple home-make crackers will join the party. 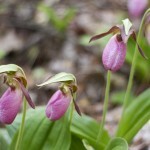 A picnic in the parkland behind our house amidst 100s of pink ladyslipper orchids wraps up the afternoon. This isn’t my fireplace and these aren’t my cranes and hooks. A girl can dream … However, I do have a rock fireplace and lots of cast ironwear along with all the make-do grates and bricks and home-made pokers you could ever need for live-fire cooking. Even if you don’t have a fireplace to cook in, the radiant heat created when you cook with cast iron in your home oven runs a close second. Our appetizer will be Colonial-era thirded gems (baked in an 1858 iron gem pan) from local wheat, cornmeal, rye and brandy-soaked dried fruit along with home-made cream cheese and a boozy hot toddy. We’ll bake one of my friend’s chickens with herbs and a kale/hazelnut pesto in a flat-bottomed dutch oven (Le Creuset is fine). A winter veggie-stuffed pumpkin will bake in an iron pot in the fireplace and the grand finale is flaming rummy skillet-caramelized fresh pears. Besides all this cooking and feasting, we’ll be talking about purchasing, and caring for new and vintage cast ironware as well as restoration of creepy old rusty iron pots and pans. There are two kinds of pickled that I can think of and one’s just as good as the other, so let’s just do both! To start, we’ll create southern mountain end-of-garden chow-chow and crunchy, 5-day fermented sauerkraut. We’ll make fixins to go with like seasonal greens, local heirloom cornmeal dumplings and 4 varieties of southern field peas slow simmered with smoky Benton’s bacon from over in Knoxville. For dessert, it’s boozy roasted peach ice cream with summer berries. You’ll each make a bottle of peach brandy liqueur to take home … ready to warm your innards when the cold weather arrives. As always, we will share our meal under the stars by lantern light. 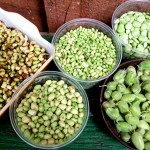 Read more about southern peas in my blog post here. Be the hit of your Thanksgiving gathering with your fabulous HOMEMADE flaky crusted heirloom pumpkin (or pecan) pie. This class will change your life! We’ll start off with smoky roasted pumpkin soup shooters & homemade oat crackers and a warm rum spiced local cider toddy then move onto fun with heirloom pumpkins. I’ll have several large regional heirloom pumpkins from our local farmer’s market roasted and ready for pies, but we’ll also discuss prepping & freezing for other uses such as soups, ice cream, muffins, breads, etc. After learning to make an amazing tender butter crust with decorative leaves, everyone will craft a 6 inch pie to take home. While the pies bake, we’ll cozy up to slices of pumpkin pie with a bit of pumpkin spice ice cream topped with candied-salty pumpkin seeds. But that’s not all!!!!! Everyone gets one of my pie cookbooks and a Cherokee flower/leaf pounded muslin bag with Candy Roaster pumpkin seeds to plant in your garden next spring. Join me for an evening of vintage, homey make-do DIY book-inspired holiday gift-making. We’ll take instruction from 19th& early 20thcentury farm magines like Hearth and Home, Farmer’s Wife and my favorite … Let’s Make a Gift from 1941, plus plenty more. You’ll go home with a slew of samples of unique items we make in class such as: 1940’s calico printed feedsack napkins, fresh cranberry rum cordial + vintage cordial glasses, rosemary-sage-garlic crunchy salt in teensy glass jars, hanging bubble glass canning jar tea lights, vanilla bean lip balm in a vintage flowered tablecloth bag … and, oh help me, this is only the beginning! We can’t create on an empty stomach, now can we? The fondue pots will be bubbling away and the punch bowl will be rockin’ with a fruity fall cocktail along with the 1960’s sleepover record player. I’m already having fun!